A few km before the Nordkapp there is a small car park and a path leading away from it. It takes you to Knivskjelodden, which truly is the northernmost point in Europe, but you can only reach it by walking 9km. My plan for the morning was to go there and then take the rest of to ride as far south as I could, but it was not to be. I woke up at 6am to the sound of rain beating on the canvas of my tent, and two thoughts came to my mind. The first one, that I could not hike to Knivskjelodden, as I did not have footwear to walk 18km in wet ground and keep my feet dry, and the second, that I was going to have to fold my tent wet, which I do not like doing at all. I slept a bit more, waiting for the rain to stop, but at 10am it was still raining, so I decided to go. Sometimes you pay a lot of money for something that offers nothing over the competence, such as anything with an “i” in front of its name or a Volkswagen, and sometimes a design is so clever it justifies its price. 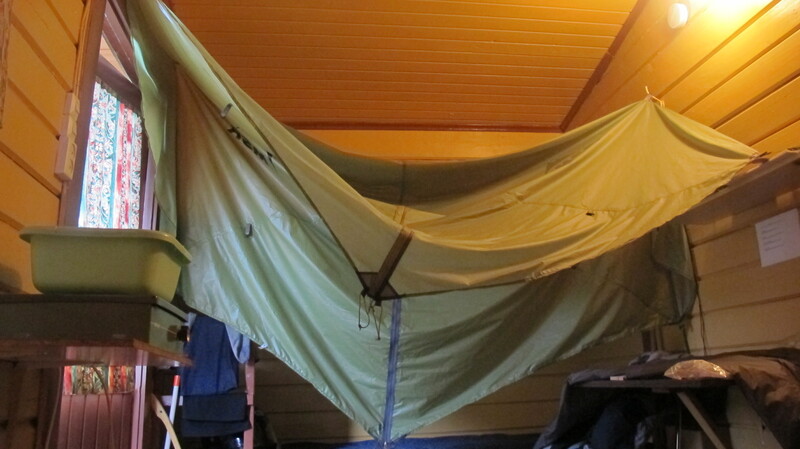 Happily for me, my tent falls into the second category, and today I discovered that you can unclip and fold the inner part without removing the outer layer or the poles, which means that both you and the part of the tent where you sleep stay dry in the process. Once I had done that and packed all my things under the protection of the outer layer, I folded the rest, put it on the bike and left. 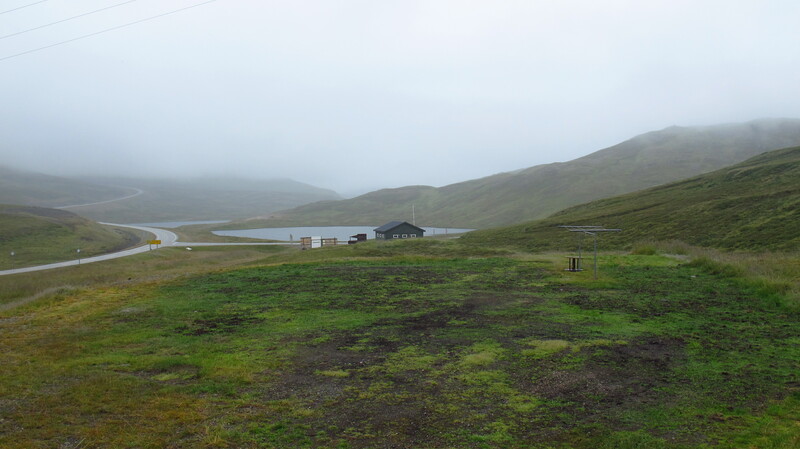 It was foggy, rainy and cold, so before setting off I had studied a list of campsites and cabin camps along the route I was going to take to have several posibilites to stop for the night. If the weather improved, I would go further, if it did not, I would just stop and find a place to sleep. Almost 350km later, I was freezing and my supposedly waterproof winter gloves had soaked through. Fortunately I had heated grips on the bike, so I kept my hands warm, although the same could not be said of my feet. The sky was overcast all around and it did not look as if it was going to get any better soon, so I just decided to stop. I checked the map and found a campsite which also had wooden cabins and internet connection, just what I needed to get all my stuff dry, tent included, and spend the afternoon updating the blog. 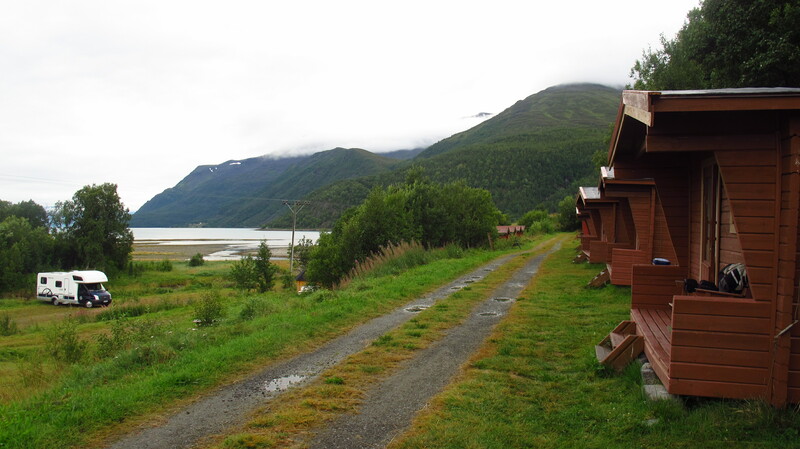 I paid and got the keys to a wooden cabin, hung up my staff all over it and turned up the heating and then went to the kitchen, where for the first time since I had entered Norway I had time to sit down and calculate costs. I was horrified to discover that the country is very expensive, and there is not much I can do to get around that. I can free camp if the weather is good, but petrol and food are still an important expense, and the cabin today and the entrance to the Nordkapp the day before had already put an important dent on my budget. I had no plan other than be in Helsinki by the 12th, where I am meeting my girlfriend to do the last three weeks of the trip together, so I did not know how far south I wanted to go in Norway before crossing into Sweden or Finland. 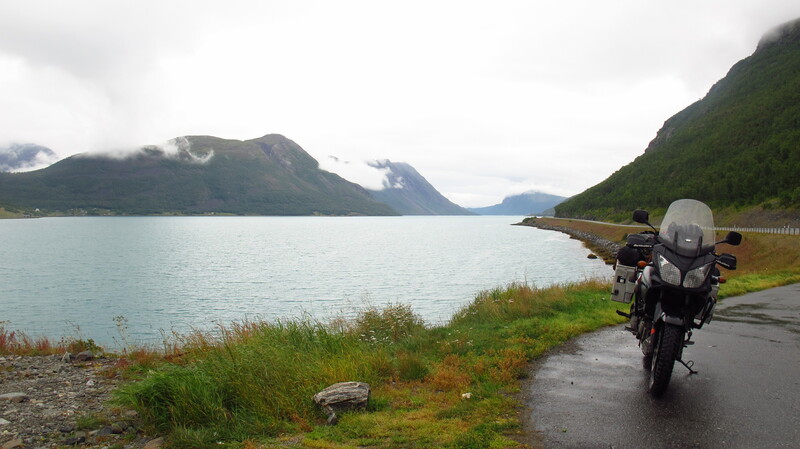 Seeing the prices here, I thought I would ride along the fjords one or two more days and then go back east. This entry was posted in Stroming The World 2013, Travel and tagged expenses, fog, rain by Kilian. Bookmark the permalink.